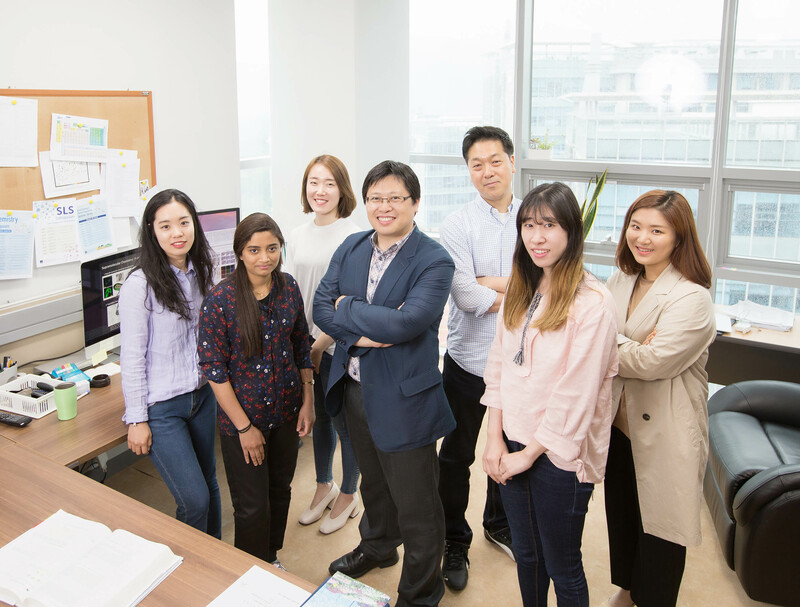 From front left are Inhye Kim, M. T. Jeena, Professor Ja Hyoung Ryu, Eun Min Go, and Eunji Lee. From back left are Seon-Mi Jin and Professor Sang Kyu Kwak. 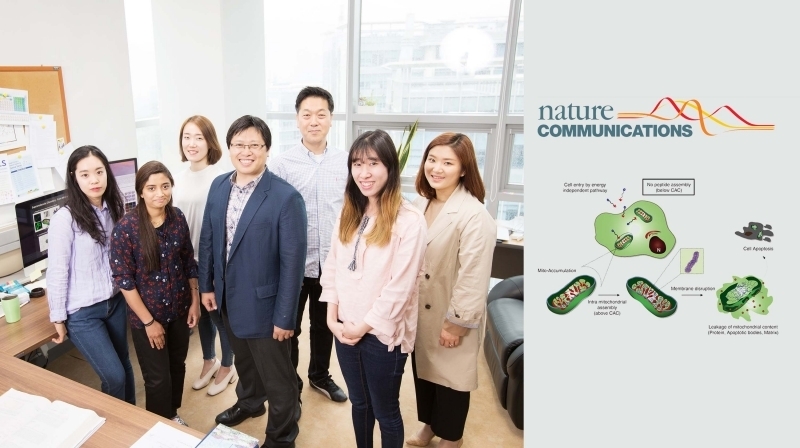 Professor Ja Hyoung Ryu and Professor Sang Kyu Kwak published their paper in the prestigious journal, Nature Communication. In-situ assembly of amphiphilic peptides with accompanying cellular functions inside a living cell (i.e., intracellular assembly) and their interaction with cellular components have been emerging as a versatile strategy in controlling cellular fate. However, achieving spatiotemporal control (i.e., inside cellular organelles or other sub-compartments) over the self-assembly of synthetic molecules inside the cell is challenging because of the difficulty of studying their behaviors in the complex intracellular environment. A recent study, affiliated with UNIST has developed a new method to target the mitochondria of a cancer cell. The research team expects that their study could pave way for new generation of anti-cancer drugs. 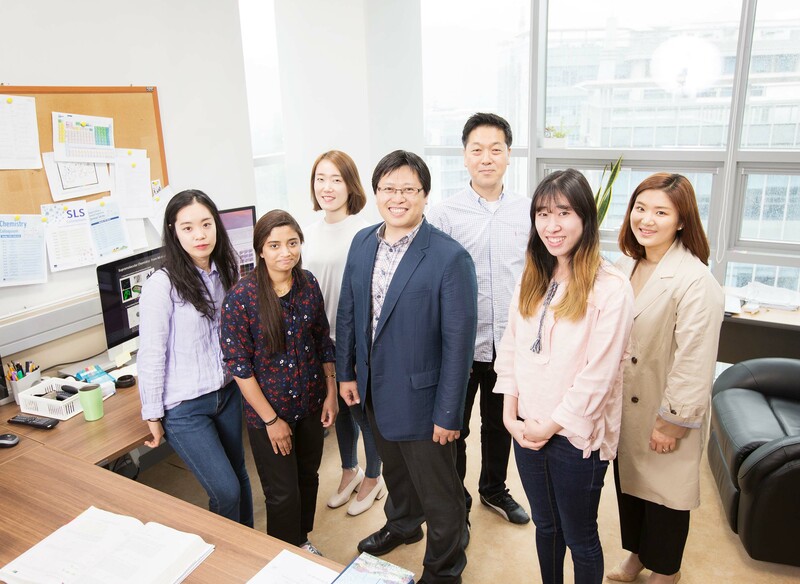 This research has been led by Professor Ja-Hyoung Ryu of Chemistry at UNIST in collaboration with Sang Kyu Kwak of Energy and Chemical Engineering at UNIST and Professor Eunji Lee of Graduate School of Analytical Science and Technology at Chungam National University. The results of the study have been appeared in the April 21th edition of Nature Communications. Figure, showing Intra-mitochondrial assembly of Mito-FF. In the study, the joint research team has introduced, for the first time, the organelle-localized self-assembly of a peptide amphiphile as a powerful strategy for controlling cellular fate. Self-assembly is an equilibrium process between the individual building units and their aggregated state, and the concentration of the molecules should be over the critical value to induce assembly (i.e., the critical aggregation concentration (CAC). In living cells, achieving the CAC is also required to form assemblies of individual molecules, but has a limitation because the chemical complexity of cellular environments disrupts interactions among synthetic building units. Intracellular self-assembly, thus, requires a higher concentration of the molecules than the CAC, which may limit the practical implementations of self-assembling molecules. Transformation of the molecular structure from hydrophilic to hydrophobic units inside the cell (or pericellular space) through external stimuli (chemical, or physical) is a powerful strategy to reduce the CAC by increasing the propensity for self-assembly. However, chemical and physical stimuli (e.g., light, temperature, pH, and redox) are not relevant for intracellular assembly because they induce severe damage to cell. 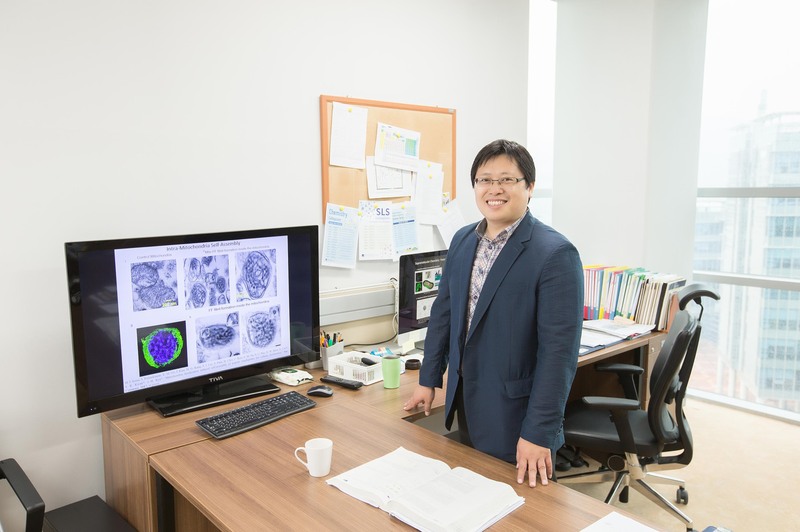 Professor Ryu’s research team introduced a specific cellular organelle-localization induced supramolecular self-assembly (OLISA) system could be a general strategy to induce self-assembly by raising local concentrations of the self-assembling molecules without additional treatment. The small molecules readily diffuse through the cell membrane, reach to the target site (organelle or subcellular compartment depending on the targeting moiety), and then they undergo self-assembly inside the targeted organelle as a result of increased local concentration. The accumulation of molecules inside an organelle like mitochondria is ~500–1,000 times higher than that of extracellular space. “OLISA is more general and direct strategy for achieving intracellular assembly and is entirely novel, it is a promising approach for controlling the cellular fate like apoptosis, cell proliferation etc. and is a useful strategy for their in depth investigations” says professor Ryu. 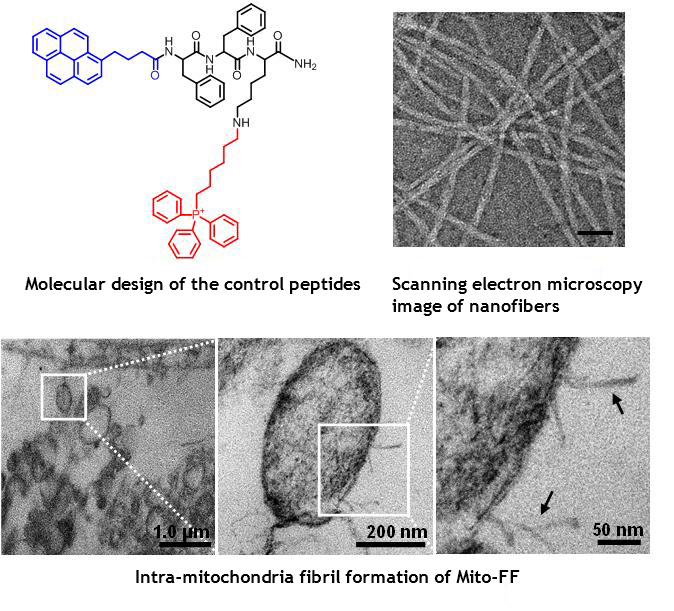 The design consists of mitochondria-accumulating amphiphilic peptide (Mito-FF), which consists of diphenylalanine as a β-sheet-forming building block, TPP as a mitochondrial targeting moiety, and pyrene as a fluorescent probe. Mito-FF favorably accumulated in the mitochondria of cancer cells because of the high negative membrane potential and the increased concentration caused Mito-FF to self-assemble into a fibrous structure, whereas lack of fibril formation was observed in normal cells. The stiff Mito-FF fibrils destroyed the mitochondrial membrane and activated the intrinsic apoptotic pathway against cancer cells. This OLISA system offers a new approach for targeted cancer chemotherapy. M.T. Jeena of Chemistry at UNIST, the lead author of the study expects the new method to set the foundations for a new series of treatments that could maximize the healing process while minimizing side effects. 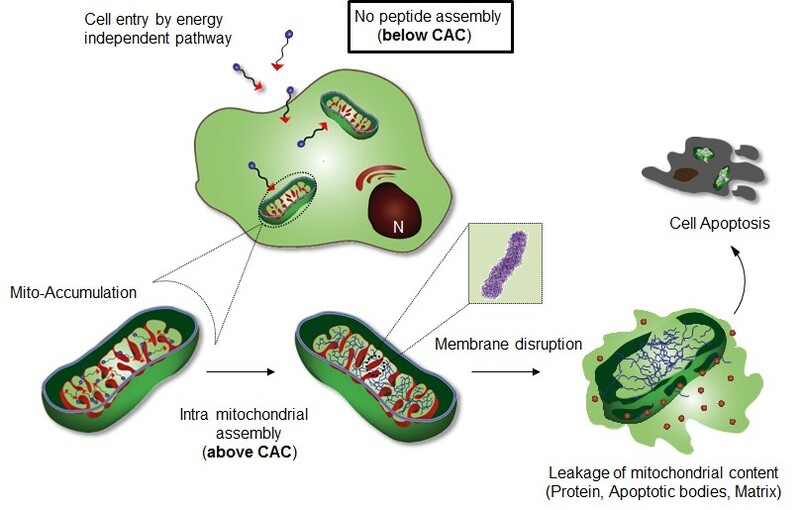 M. T. Jeena, et al., “Mitochondria localization induced self-assembly of peptide amphiphiles for cellular dysfunction” Nat. Commun., (2017).